I was provided the below mentioned products in order to host a party. On Saturday, September 6, 2014 I participated in Fit Made Fun Day. I was sent a fun party pack from Leap Frog and Cliff Kids. I invited over some friends and family. Unfortunately it happened to be the same weekend as my brother in law was taking my nieces and nephews on their first vacation to the beach. So about half of the invited kids could not make it. But we still made it fun even though it was small. This day was picked to coincide with the global launch of the LeapBand, the new wearable activity tracker from Leap Frog. This was a day to encourage kids and their families to jump into motion and experience the fun of an active and healthy lifestyle. I was very excited to work with Leap Frog on the launch of this great new product. It is so important to get kids moving. With all the electronics out there it is great to see one that encourages moving and getting fit. The LeapBand is a great activity tracker for kids. You get to pick a virtual pet to help you along in your journey to physical fitness. And you get to care for your pet by giving them food, water, and a bath. The LeapBand tells the time, has a timer, and more. There is an activity button that you push and it will tell you what to do, like jump 5 times. As you do your activities you get to collect jewels to keep in your treasure box. The boys were excited to get started. 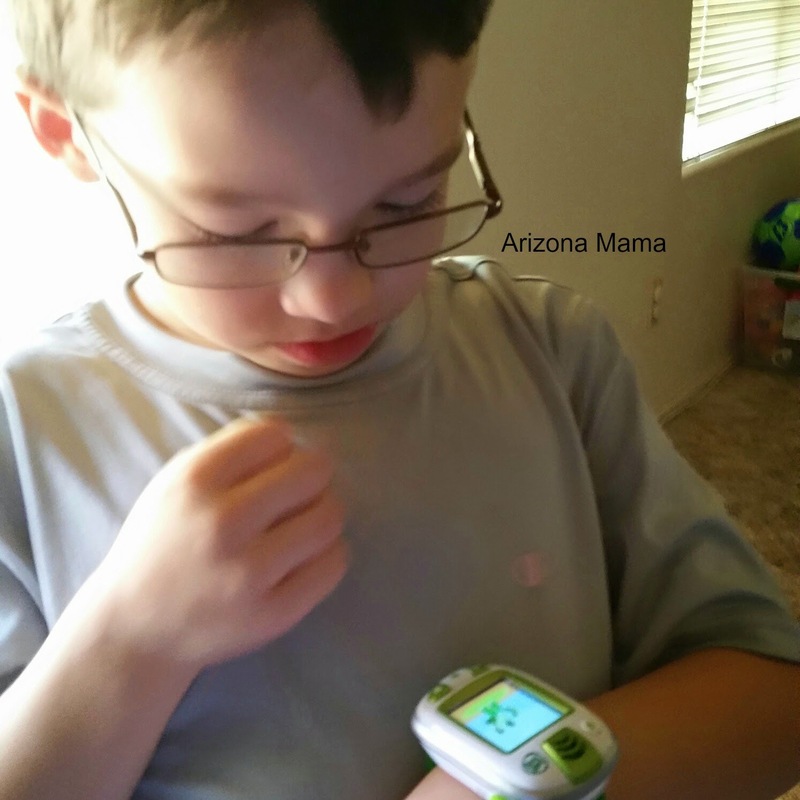 They followed some of the simple activities the LeapBand told them to do. They loved the timer the best. They would press the time are see how fast they could run. Then we decided to pull out the trampoline and see how many jumps they could do in 30 seconds. They all wanted a chance to try it out. Jayden won for most jumps, Aidan won for highest jump, and Evan won for being a good jumping buddy. After a good workout it was time for a snack. The boys each picked which Clif Kid Zbar they wanted. 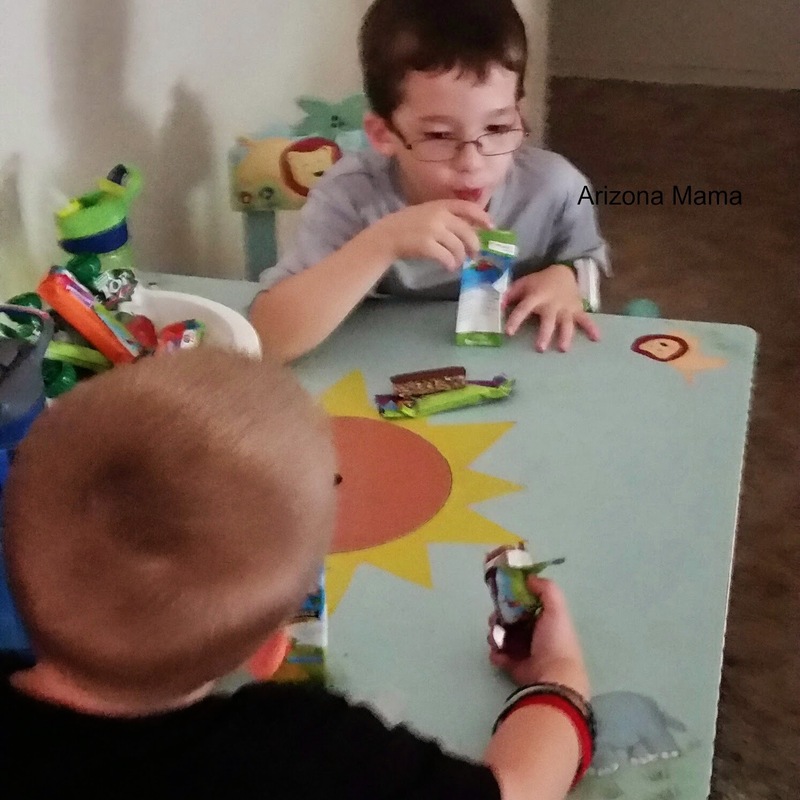 This is the first time we tried these bars ad they were a big hit with the kids and even us adults liked them. When they were done with their snack the kids wanted to get active again. Jayden loves collecting jewels for his treasure chest. 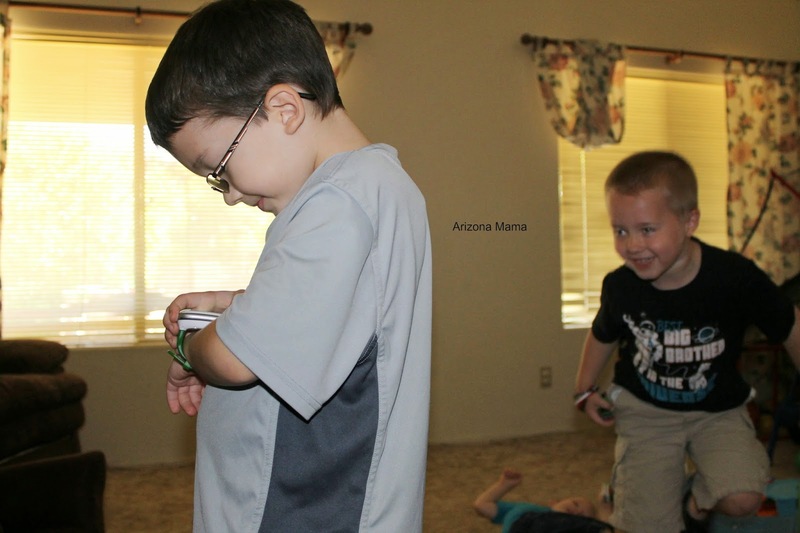 The LeapBand s a great way to encourage your kids to get active. Thank you to Mommy Parties for selecting me to participate. 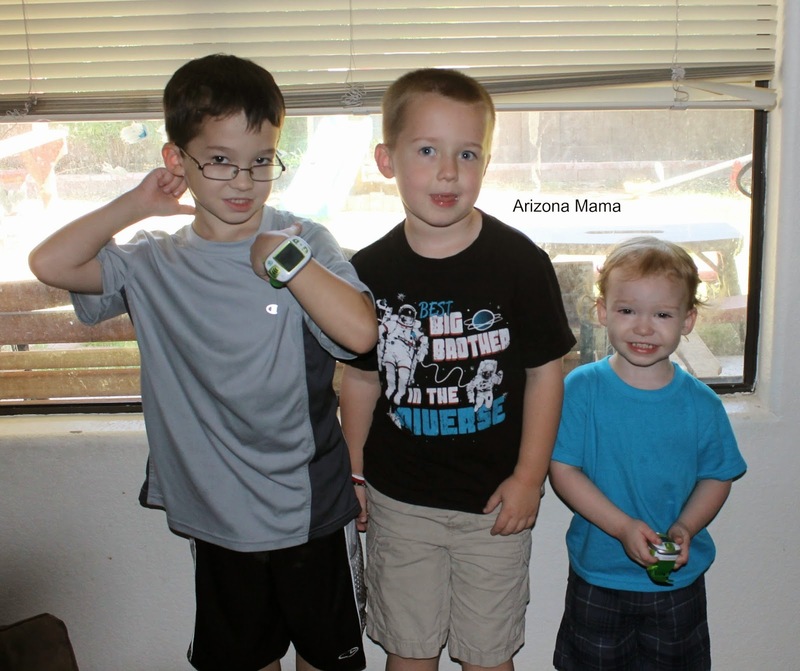 My boys would love those LeapBands! That is a great way to keep them active. I'm obsessed with my fitbit which is the same concept. I love that they are getting kids up and moving! This is so neat, Leap Frog always has great products. It is great that the kids can have fun and exercise at the same time. My kids saw the LeapBands at Walmart over the weekend and were impressed with how loud they were. Do they turn off on their own? What is the ages for these? I know at least two wanted them, the older two were just like it's loud, can I get online? But I know the younger ones would get a kick out of how fast they run and the other activities. They do turn off on their own after a period of no use. The ages are 4-7. My 2 year old loves it, but doesn't quite get the concept. I think LeapFrog nailed it with this one. What a super way to keep kids moving! This is such a great way to keep kids interested in being active. Anything that co do that is a plus. It should be fun when kids are active, and this is one of the ways it can be fun. I like the idea of combining fitness with a pet, as that can translate directly to the real world. I have always loved LeapPad products. The Leap Band looks like another great innovation from them. Those do sound like a fun way to keep the kids active. I love LeapFrog products! These bands are SO COOL! My son is a little too young to really understand how to use it, but when he gets older they will have improved even more. This is really neat. Love all the products. We love Leap Frog products. It's great that they have this Leap Band to keep kids moving! These are so cool! We love Leap Frog products at our house. They're really great teaching tools. Wow, this product sounds amazing! It is the perfect way to get kids excited about being active. These little bands look great for kids. I was telling another blogger that they should make these available to overweight kids who are struggling. This might be just what they need to get moving in the right direction. Like a Fit Bit for kids!!! Teaching about health and fitness at a young age is so important. This makes it into a fun video game. Those bands are a great idea! We love the regular Cliff bars, I didn't even know they had some specifically for kids! Clif bars are my favorite! I love that watch too, how fun. What a unique concept! I love that they all won too! !